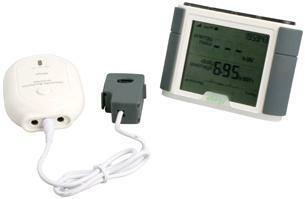 During 2007 and 2008 efergy was one of the best selling wireless energy monitors. Click here to read our comprehensive efergy review. Now a new efergy model is available – efergy eLite – which offers all the powerful features of the original efergy wireless energy monitor, but with a much improved and larger display and economy 7 (dual tariff) compatibility. Click here to read our new Efergy Elite Product Review. NEW Click here to view our new comprehensive guide to Wireless Electricity Monitors with the latest models and up to date pricing. If you are interested in efergy elite also have a look at the new improved OWL/Electrisave – the OWL CM119 Wireless Energy Monitor (does not offer dual tariff compatibility, but it is cheaper). As with the original efergy wireless power meter initial installation is very quick and simple. Setting up the new dual tariff is very simple. The start and end time for tariff 1 and tariff 2 can be programmed in together with the electricity costs for each tariff – e.g. 5p per kWh (unit of electricity) for Economy-7 which starts at 1am and finishes at 8am every day, and 12p per unit the rest of the time. 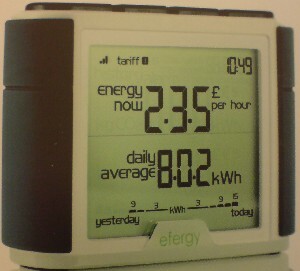 The Efergy display unit can be set to show instantaneous, historical, and average information on its screen. The daily average information is very useful as you can watch your average consumption drop as you take energy saving measures around your home. In addition, a pair of bar graphs compare your electricity consumption today with that of the previous day as shown in the image above from the instruction book. In history mode it is possible to examine daily (last 7 days), weekly (last 4 weeks), and monthly consumption data saved over the previous couple of years. In instant mode you can either view the current power consumption in kW or the costs per hour – i.e. how much it would cost you financially if you were to continue to use the current amount of power for one hour. In addition to the printed instruction manual supplied with Efergy Elite, there is a also a guide to saving electricity in the home. At the back of this guide is an electricity data logger which you can fill in with your weekly consumption data to track how well you are doing over the course of one year. Consider also the new OWL CM119 Wireless Energy Monitor.